I'm sad that we've come to the end of this lovely celebration! I've loved celebrating my favorite heroine and the world in which she lives, and I'm so thankful for the two kindred spirits that made this event so much fun! For this final post, we're sharing further reading recommendations. Rachel's sharing fiction for Anne-lovers, Alexa's highlighting related non-fiction and I've recommending other books by L.M. Montgomery that you should consider. There's something for everyone in our posts today, so prepare your TBR! 1-3. 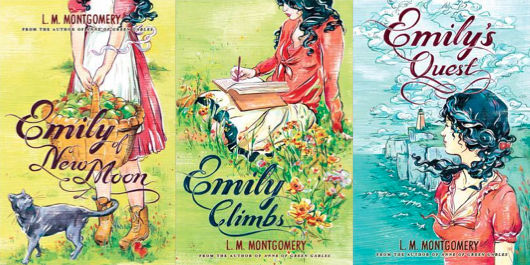 Emily of New Moon, Emily Climbs and Emily's Quest - After finishing the Anne series for the first time, I was in desperate need of another heroine to love! Although they share a few similarities, these series are very different overall. Emily is more reflective of Montgomery's personality, and I believe the books are more serious in tone (if I remember correctly). In the first book, you'll meet Emily Starr. She's an orphan sent to live with her mother's snobbish relatives, and she's miserable at first. But, like Anne, she soon begins to make friends and charm everyone with her imagination. A big focus of the series is Emily's desire to be an author, so it follows her writing journey (which I always loved). My one complaint about this series? The romance was very unsatisfying! 4. The Blue Castle - MY FAVORITE. Seriously, I absolutely love this book! It's my second most-read Montgomery (after Anne of Green Gables, of course). Valancy Stirling is 29, unmarried, and lives with her overbearing mother and meddling aunt. She's always done exactly what she's told, but shocking news from the doctor causes her to rebel against her family. You'll have to read to discover what happens next! 5-6. Pat of Silver Bush and Mistress Pat - I think I read this series after the Emily books, and I remember being surprised by them. Pat is quite a different heroine! I believe I found her a bit unlikeable when I first met her -- though I enjoyed many of the secondary characters. These books revolve largely around Pat's love for her home and her desire for her life to remain exactly the same. Of course, you know that can never happen. 7. Magic for Marigold - This book follows a young girl named Marigold throughout her childhood. If I remember correctly, this book is a series of stories and episodes from Marigold's life, which reminded me a bit of Rainbow Valley. Marigold is an imaginative young girl, and you get to follow her many adventures and mishaps. 8. 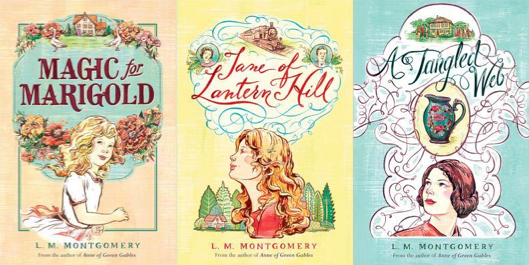 Jane of Lantern Hill - Jane has grown up with her mother, her grandmother, and her aunt. In the absence of her father, she's always believed that he's dead. When she learns that he's alive and well, she gets the change to spend a summer with him on Prince Edward Island. She dreams of reuniting her parents in a new home! Well, there you have it! Nine books by L.M. 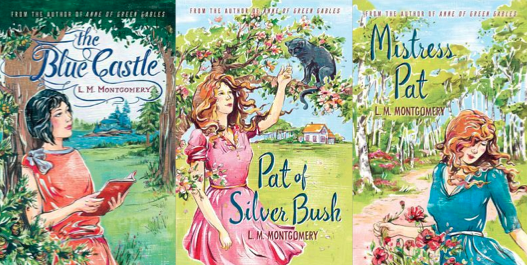 Montgomery that you should read after finishing the Anne of Green Gables series. I hope you've found something that interests you! Montgomery has an extensive backlist, including numerous short story collections. If you're a fan of her work, there's so much for you to explore! And now, it's time to say goodbye to Return to Green Gables. If you're already a fan of Anne, I hope we reminded you of all the reasons she's so special... and if you've yet to meet her, I hope we've convinced you that it's time you do! There's no one quite like Anne, and I wouldn't have it any other way. I have a lot of L.M. Montgomery reading to do! I've only read The Blue Castle (thanks to you! ), but I do think that all the others that I haven't checked out just yet sound really great. Adding them to my wishlist now! Thank you so much for this list! I've been wanting to read more of L.M. Montgomery for a while but wasn't sure where to start. The Blue Castle sounds fascinating!